TOFU MOM . . . and gravy! : Vegan Scalloped Potatoes with LOTS of Garlic!! Vegan Scalloped Potatoes with LOTS of Garlic!! This is one of my family's most requested dishes. Not just my kids, but the extended, non-vegan part of the family as well. And no, you wouldn't guess they're vegan. VERY rich, creamy and garlicky. Don't worry, the long baking time mellows the garlic considerably. Soak the cashews in hot water 15 min or so while you wash, scrub and if you need, peel the potatoes. (I never peel them but if using Russets you might want to). In a food processor, blend cashews and hot water (adding more as needed to make the consistency of pancake batter). Blend until VERY smooth and creamy, 5 - 7 minutes. Add cornstarch, tofu, garlic, nutritional yeast (if using), paprika, pepper and salt. Blend again until garlic is finely blended. (You may have to do in two batches if you have a small food processor). Personally I usually don't add the nutritional yeast, it mainly just adds a yellow cheesy color, not a lot of flavor, but it's up to you and your preferences. Slice potatoes in potato-chip-thin slices (I use a mandolin slicer here). 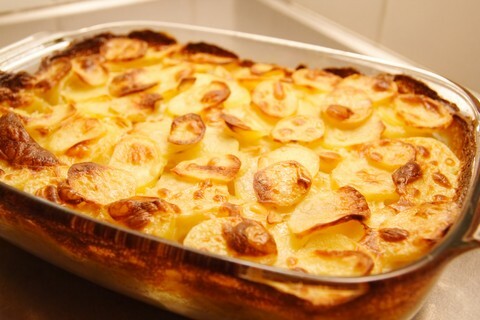 Place a layer of sliced potatoes in a large (9 X 14 or "lasagna-size") greased baking dish. Pour a cup or two of liquid over potatoes and continue to layer potatoes and liquid until pan is almost full. Push potatoes down with back of spoon as you go, so they are all covered. If more liquid is needed, just pour more soymilk in on top, you want the potatoes covered, barely, but not swimming. Cover pan tightly with foil and bake 45 - 60 minutes or until the potatoes are tender when you poke them with a knife. Top with seasoned bread crumbs and another sprinkle of paprika and place under the broiler for 2 - 3 minutes or until it's browned. Or skip the breadcrumbs and just broil till browned and bubbly. Good either way. Remove from oven, let sit 5 - 10 minutes before serving. You had me at potatoes....I will have to figure out a way to make this soy free nut free for the kiddos, maybe coconut milk.....and pureed squash or something to mimic the creaminess of the tofu?I will probably use about 12 cloves of garlic as well. Thanks for sharing. The cashews and tofu could be left out - just need something to thicken the sauce... hmmm... thinking... Maybe make the sauce with oat milk or hemp milk (my fave because it's SO creamy and thick)and then cook on the stove with cornstarch to make a white-sauce type-thing and THEN bake? Coconut milk seems to get a bit... oily when baked in this, but let me know how yours turns out PLEASE!! Add the garlic before baking but don't cook it in the sauce. Of course, now we're talking a somewhat different recipe but I think the end result would still be SOOO good!! This looks seriously delicious! The perfect comfort food for the coming cooler days of fall. These sound AMAZING! Hooray for fall food! damn, that's a lot of garlic. it looks fantastic. This looks amazing. And you are always so clear with your recipes- "until the consistency of pancake batter"- much appreciated! I must try it! These potatoes look fantastic! Thanks for posting the recipe. I also want to tell you that your recent post about how little you spend on food and the budget challenge has inspired me to cut my grocery bill by 1/3 to 1/2. Thank you! I adore scalloped potatoes and have tried veganizing them several times, but this recipe looks like the best! The tofu is a brilliant idea! OK, these potatoes look fabulous! I will be making these and trying them out on my non-vegan family. It will be fun finding vegan recipes to make for holiday meals. Thank you for sharing! This looks really good. I can't wait to try it! Question, though - what do you do with the soymilk? Does that go in the cashew-tofu mixture? ~~Jessica, good catch! Yes, add the soymilk to the blended cashew mixture. Mix well and continue with recipe as directed. I was very much in need of some comfort food due to all the @$%$^& going on in my life lately. This recipe really filled that need. Thanks again for a totally wonderful recipe. Thanks for the clarification - you know I was reading so carefully because I was getting ready to make this! It turned out really well, thank you. I will be doing this again and I agree, it is a great dish to bring to share with everyone, vegan or not. Oh! I tried this recipe tonight and it was sooooo satisfying! It was so creamy and comforting.